Take your favorite foods to-go with the Ultra•Seal™ 4.8 Cup Round Divided Dish. 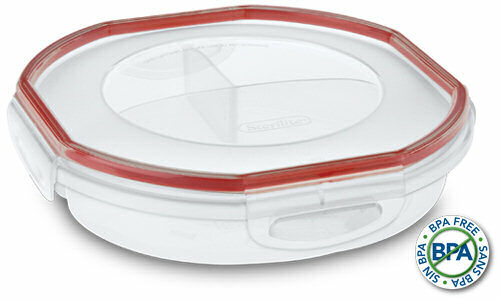 It offers an ideal solution for storing and transporting full meals. It features a color-coded matching system to help find the correct lid and base combination without rummaging through the cupboards. 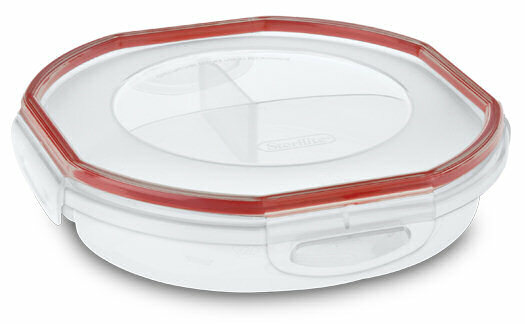 The Divided Container also features a large section for storing an entrée and two smaller sections for side dishes. 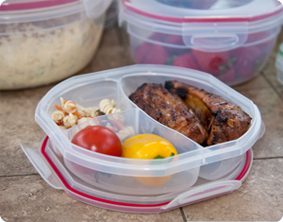 An airtight and leak-proof seal is created by four latches and a silicone gasket and helps to keep meals and leftovers fresh for longer periods of time. As with all Sterilite foodware items, the Ultra•Seal™ divided container is safe for freezer, microwave and dishwasher use, as well as BPA-free and phthalate-free. The overall dimensions of this item are 8 1/8" L x 8 1/8" W x 2 1/8" H.
Overall Assembled Size: 8 1/8" x 8 1/8" x 2 1/8"
Perfect for packing a lunch for work or school. 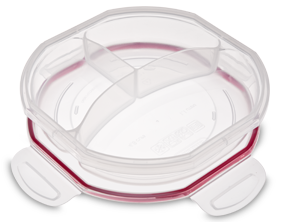 UltraSeal 4.8 Cup Round Divided Dish is rated 4.3 out of 5 by 7. Rated 4 out of 5 by adamo from UltraSeal 48 Cup Round Divided Dish I like how this product offers a great solution for storing and transporting full dishes without having them leak. The Divided Container features a large section for storing an entrée and two smaller ones for veggies or for whatever you want. Rated 5 out of 5 by hana from Overall the product is multipurpose I have been using this product in the kitchen for everything like storing hot or cold stuff.It divided so you can keep multiple items and take it outside .No need for 2 containers just one container does the work of 2 containers. Rated 5 out of 5 by Margo from Long term use I have used sterlite products for about 8 years. They last alot longer than "the other storage" products. I always recomend your products. Rated 5 out of 5 by Mrs. Easterbunny from Great for Lunch! This divided container with it's microwave airvent is fantastic. It allows the user to take a delicious home cooked meal to work and gives good portion sizes (without portion distortion) for dieters. Additoinally, the tight seal allows the food inside to not smell/taste like others in the fridge. Rated 4 out of 5 by REProphet from Label doesn't come off We've been using these for several years for lunches and take away at restaurants. It keeps us from using styrofoam and waste. We like them very much. We bought two more, so we would have a set in our second vehicle. We also bought a couple of bowls. On the new Sterilite, the labels don't come off. We have soaked them for hours and the label does not begin to peel off. Before I was impressed in howeasily the labels came off. Now I don't know what to do. Rated 2 out of 5 by Anonymous from Great product....For awhile. Lid snaps break. 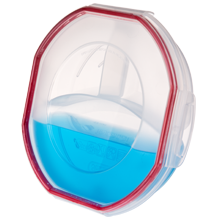 I purchased several sets of the Sterilite Ultra-seal containers. They are really good containers for awhile, but then after multiple uses inevitably the snaps on the lids begin to break off one by one. After a year or two, I now have approximately 50 containers and all but a few have broken snaps on the lids. Needless to say this does not produce a tight seal on the containers. I think Sterilite should offer their snap lids for sale so that customers don't have to repurchase the entire container. The lids/snaps are definitely the weak link in this product. I would gladly purchase this line again if they could fix this particular issue. In the meantime I will look for a different product. Rated 5 out of 5 by ReadMore from Best I've Found for Lunches We've had this container for about 4 months. The seal is like new, and it doesn't pick up food coloring like other containers sometimes do. The sloped interior makes it very easy to clean. The size is small enough for our lunch bags, and it's large enough to hold enough leftovers and food for lunch. We just have one, so we're looking for more. Haven't found it yet--they're hard to find.